During lesson today I noticed Mr. Koga's circular breathing technique, and thought to share it with you. My vids after one day of practice.. Cool. Except to practice with the straw in a cup of water it helps to put a slight bend in the straw, otherwise the bubbles are too forceful like in your video. With the smaller bubbles the back pressure stays more constant, it's closer to the feel of playing an instrument. Without the bend it's too hard to keep a steady air stream, it feels like there's a fight going on with the air pushing out really hard while the bubble forms and then becoming easy for a moment when the bubble is released. How fast individuals learn vary, but it took me about a year of about an hour a day (or more honestly it was probably closer to every other day) practice on a didjeridu to get it to a point where I was satisfied with it. I've heard people say they've learned it in a week, but then I have to think that they didn't learn it quite as well. As it is, even with more practice and use over the 10+ years or so since, I know I could still get a lot better at it, even on didjeridu where it's easier. I'd suggest getting the practice transferred to an instrument soon because it's boring practicing with the straw in water, I consider the straw in water more of a "proof-I-can-do-it" rather than practice. If it seems too much of a stretch to learn it on shakuhachi, try an instrument that's a bit easier for it as a stepping stone, like a didjeridu (a 3 foot 1.5 inch diameter PVC tube will serve the purpose) or a Balinese suling. Balinese suling would be easier on lips that intend to play shakuhachi, there's a French shakuhachi forum member that makes and sells them, the search function should find him. They should be fairly inexpensive. BTW, I find it interesting that you found a master teacher who actually uses it. 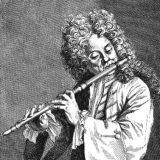 When the topic has been brought up here before it seemed that the consensus was that yes, it could be done, but had no place in traditional music... probably a true conclusion, but it implied that it wasn't a worthwhile technique to learn. I've got to admit that in structured music (traditional or Western) I find little use for it, and although it comes in handy for improvisations, it's not an essential technique to learn. However, the discovery that goes on in learning to coordinate the various breathing apparatus involved I think is an invaluable experience. Is Mr. Koga teaching the technique to his students? Wait a minute! I know I wrote "traditionl mus1c" not "Biblical noise" !!!! Guess again! I can easily circular breathe on shakuhachi. I'm surprised to hear you say how easy it is to circular breathe on tube of delight. I played didgeridoo before tube of delight, so I can circular breathe, but I think tube of delight is more difficult (to get a musically useful sound) than sax, trombone, oboe, or other similar instruments because there is no back pressure. I see there are many posts where you say you were able to get it working. Curiously, I found it more difficult on sax and never got it working well on that instrument. radi0gnome, thanks for all the advice, I have a long way to go for sure. About your question, "Is Mr. Koga teaching the technique to his students? ", he did not call it "circular breathing" and said it is part of his open breathing system. He said he stumbled upon it some 30 years ago and only knows one other person who plays this technique. About the puffy cheeks, Mr. Koga plays with puffy cheeks at all times, it is part of his breathing system. I sincerely doubt it has anything to do with circular breathing and when I looked closer as I was taking the video, much of the activity was in the throat area, not the cheeks. Akikazu Nakamura also circular breathes with significant use of throat area rather than puffed cheeks. I took a workshop with him on it at the Boulder Shakuhachi festival.To this day , i can do the bubbles though the straw but not play the shakuhachi. It's harder to do on a shakuhachi but still not that difficult. I don't think the musical results are that interesting. In reference to Mr. Koga "open system", Mr Koga just uploaded one of his books (previous lecture as well), on youtube. For those who are interested. Uploaded to Youtube today, "Circular Breathing - Advanced level/ Masayuki Koga", for those who are interested in the subject. "Feel the Lumber vertebrae straight, the hip-bone (sacrum) is solid like rubber, and relax your shoulders." Esoteric wisdom? Not likely, no matter how straight your wooden spine might be. At first glance this appears to be a typical example of bad computer translation, and it probably is, in part. A computer, however, would not substitute words because they look similar (lumbar, Lumber); this text has been edited by a human to add a further layer of nonsense. So, does Koga know something that we should learn? Maybe so, but such a farcical presentation doesn't make a convincing case.